In Kiltimagh, Ireland last month, the local 40-year-old St. Patrick’s Day parade paused its sensational performance for half a minute. A testimony to his sobriquet, “The World’s Most Famous Mummer,” for 30 seconds, the streets of Mayo County applauded with great respect for South Philly native, string band legend and captain emeritus Bob Shannon, Jr. of Quaker City String Band, who passed away March 4 at the age of 71 years old at home in Blackwood, New Jersey. Standing at 6 foot, 10 inches, the larger-than-life showman – with an even larger-than-life heart – was celebrated across the country and across the globe, including, of course, on the streets of Pennsport last month, when his funeral proceeded from the Murphy Ruffenach Brian W. Donnelly Funeral Home to Resurrection of Christ Cemetery in Bellmawr, New Jersey. Surrounded by dozens of his beloved string bandmates, Quaker City members say the sendoff was an appropriate way to honor one of the most renowned Mummers of all time. Born in South Philadelphia, Shannon, a gifted saxophonist, followed in the footsteps of his father, who was also a Quaker City Mummer, joining the string band as an adolescent. After graduating from Darby-Colwyn High School, the father to four and grandfather to five, who also attended the University of Delaware, began his nearly 40-year tenure at Quaker City when he was in his early 20s. Making his mark on Mummery, the nearly 100-year-old string band, which entertains audiences across the world, swept nine band first prizes and seven captain first prizes under Shannon, say Quaker City members. That “big guy,” Quaker City members say, was always requested at the string band’s gigs, which spanned from South Philadelphia to Murcia, Spain. Strine shared a story about Shannon being recognized for his height by strangers all the way in Jacksonville, Florida – evidence of his untold impact. “As big as he was, he was so gentle and pleasant and soft-spoken,” added Quaker City business agent Mike LaPergola. Although Shannon, who worked as both a civilian employee of the Department of Defense in Philadelphia and a Phillies usher at Citizens Bank Park, strutted mammoth back pieces in the 1970s and 1980s, the costumes eventually downsized, which allowed him more mobility during performances. This transition led to Shannon’s iconic quick costume changes – sometimes three in just one show. Quaker City members attribute Shannon’s swift suit swaps to sparking the more common captain costume changes traditionally seen now in Mummers performances. “He had good guys helping him to get him in and out of those costumes pretty quick,” Susan Shannon said. Throughout his close to 40 years as captain, Quaker City members could not recall Shannon ever missing a performance, including the band’s 30-year trips to the St. Patrick’s Day parade in Ireland or a Mardi Gras celebration in Galveston, Texas. Touching the lives of everyone he entertained, Quaker City members say individuals from Texas made the trip to South Philly for Shannon’s funeral, which was even live streamed over the internet to Kiltimagh, Ireland. After his captain chapter ended in 2008, Shannon, who served for several years as the president of the Philadelphia Mummers Association, continued to cultivate the rising members, acting as a father figure to new captains. “He would always march with the band, but to the side, because he wanted the other guys who were captain mostly recently to stand out on their own and be their own person,” Susan Shannon said. But Shannon’s helping hand even spilled beyond the Mummers, as Quaker City members say he was very active with children’s charities. 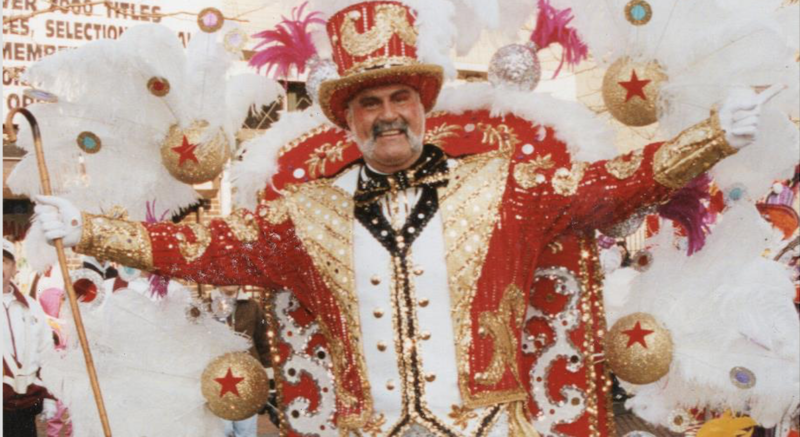 Not only was Shannon inducted into the Mummers Hall of Fame in the 1980s but he was named a Blue Sapphire service award winner by Rowhome magazine in 2018. Dedicated until the end, Shannon’s final performance as a Mummer was only one day before his passing, as he participated in the Fourth Annual St. Patrick’s Day Parade in Gloucester City on March 3. Reflecting on his legacy, Quaker City members considered the wisdom Shannon bestowed on them both in the parade and in life.